1. Open the pre-registration page. 2. Enter your email address and your device's MAC address; select "I agree" and click [Submit]. Click here for more information on finding your device's MAC address. 3. Verify the information and click [Register]. 4. You should receive an email from FREESPOT shortly. Click the URL in the email. Note: Configure your anti-virus and spam filter to allow emails from the "@freespot.com" domain. Note: Some devices may not be able to register on the spot. Click here for more information. 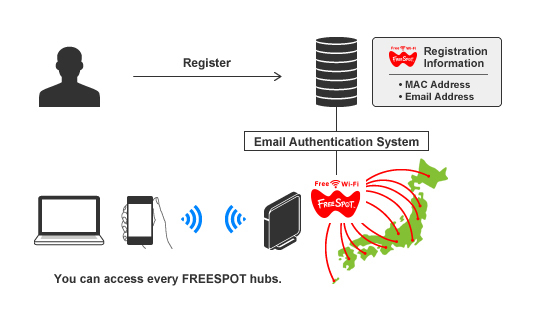 - The FREESPOT email authentication system manages the combination of the device's MAC address and an email address. - You need to register your email address for each of your devices. - You can register an unlimited number of devices. - You can use the same email address to register multiple devices. Once you are registered, you can access all FREESPOT hubs in Japan. Your account is active for 6 months from your last access. 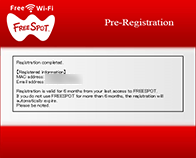 If you do not use FREESPOT for more than 6 months, your account will be disabled and you will need to register again. Open the unregister account page and enter your device's MAC address and your email address. - To change the email address, open the pre-registration page and register your new email address. - To change the MAC address, open the pre-registration page and register your new MAC address. Please note that the previous MAC address remains valid even if you enter a new one. To completely disable the previous registration, open the unregister account page and enter the new MAC address and your email address. FREESPOT is managed by the property owner's Internet connection. 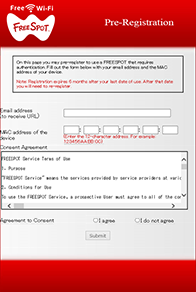 Therefore, if a FREESPOT user engages in any illegal online activities, the owner may be held responsible as the connection contractee and the FREESPOT service may be terminated. To prevent such a case, FREESPOT uses the email address registration system. This system protects FREESPOT by maintaining an Internet usage log and tracing any illegal users. 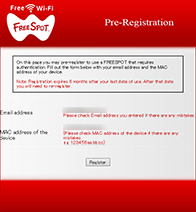 Please register your email address and use the FREESPOT service responsibly.